I have a man-crush on Dave Grohl. I can admit that. When the sounds of Nirvana caught my ears (ok...they caught EVERYBODY'S) in the early nineties, I had no idea who their drummer was. 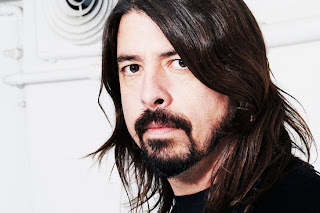 Truth be told, I really didn't have a read on Dave Grohl until the advent of the Foo Fighters* in the mid 1990s. From then 'til now, I've gained an appreciation for Grohl's drumming style, his songwriting, guitar playing and producing skills. He has been involved in countless successful and creative projects, and seems to have limitless energy and drive to create. Every time I hear word of a new project, I'm immediately interested and look forward to the release. And, like many of his fans, I've rarely been disappointed. As with earlier features, I have no intention of providing even an attempt at a total picture of Dave Grohl. If you already know him, you know more than I'll provide here, and if you don't know him (what's wrong with you?! ), let this simply serve as a point of entry in your inevitable Dave Grohl fandom. For a more complete history, go here. *True story - my personal DW Collector's Series drum kit was played by Taylor Hawkins in 2002 when the Foo Fighters performed in Salt Lake City for the Winter Games. The backline company who supplied drum kits for the Olys sold them locally after the games were over. I was in college at the time and put together every penny I had - and then some - to buy one. I still have and play the kit regularly.